Spiders, which are arthropods and not insects, are very common in and around homes. Although many people may fear spiders, spiders are considered beneficial pests as they feed on insects and other pests. Some common spiders that we typically find in the Central Valley include the common house spider, garden spiders (orb weavers), the wolf spider, the black and brown widow spider and the brown recluse spider. Generally, only the brown recluse and the black and brown widow spiders pose any danger to humans. Spiders that may harm people with their bites, typically construct their webs in secluded areas (under furniture, in corners of rooms, in woodpiles, in storage boxes, cracks and crevices, etc.). It is a good idea to wear gloves when working in these areas (restacking woodpiles, cleaning storage areas in a garage, etc.). 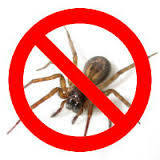 InspectorUSA offers Spider Control as part of our Problem Solver Services. After a thorough inspection we will develop a treatment plan that is designed to manage the spider population around your home within the 90-day treatment window. After our inspection we will proform an intensive interior and exterior initial service designed to quickly reduce the spider population inside and outside. We will also provide recommendations to you about how to keep spiders from entering your home. After the completion of the initial service we are available to provide additional service as needed simply by calling and requesting it. And remember because spider control is part of our Problem Solver Services additonal service calls are provided at NO COST for the duration of your service contract. Also at the end of your service program you will be given the opportunity to upgrade to one of our other pest control programs. Don’t share your home with spiders! Call InspectorUSA Today!